CDs Are Dead! ...Or Are They? Will Taylor Swift Exercise Her Nuclear Option? Currently one of the most powerful operators in the music industry, Taylor Swift's contract with Big Machine Records has come to an end, giving her freedom to go out on her own, shop around and choose another label...or maybe not. The baseball season ended last weekend with your 2018 Boston Red Sox (wow, that’s a lot of them!) beating your City of the Angels Dodgers in five games. Upon the completion of the World Series, which was last Sunday, teams had 5 days to exclusively negotiate with their players who were no longer under contract. Most of these free agents don’t sign within those five days so they can field offers from other teams and see what they’re worth on the open market. Baseball’s biggest free agents this off season, Manny Machado and Bryce Harper, are both hoping to break the record that Giancarlo Stanton of the NY Yankees set in 2015, when he signed a $325 million 12-year deal with the Miami Marlins (who, by the way, couldn’t really afford the contract, thus Giancarlo is a Yankee). We have free agency in music too. Music’s biggest free agent this year, and probably in the history of music, is Taylor Swift. The scuttlebutt within the industry is that might stick with Big Machine go to one of the Universal labels, since UMG is the biggest label group with arguably the deepest pockets. THIS ARTICLE in Billboard discusses some of the complexities of a deal with Swift, including Big Machine’s potential sale of itself and how any sale price would be tied to whether or not Swift received control of her catalog of master recordings. Thus, Big Machine has to juggle possibly selling themselves for $300+ million and re-signing Swift to keep the masters in house. Lose Swift and her 34% label market share and that $300+ million price drops. From the Swift perspective, she has one option that has the potential to change the industry for superstar artists at end-of-contract going forward: Signing with nobody and going it alone. I call this her nuclear option. In this option, Big Machine loses. Her other label suitors lose. And Swift, conceivably, wins. Big. But there’s risk. There’s no $325 million guaranteed 12-year (or album) contract. There’s no label support, be it radio promotion, marketing, or tour support. Taylor’s Nuclear Option would not be unprecedented. Just look at Chance The Rapper, who has been going it alone from the beginning. THIS ARTICLE in the November 1, 2018 issue of Rolling Stone explains a little bit more about what Chance has done and why more artists are thinking about going that route without a major label. Although BMLG handled various functions for Swift in her early career, over the last several years she has brought almost all duties — including marketing and branding — in-house. While BMLG may still work any songs to country radio, since 2012’s Red, she has increasingly moved over to pop, with Universal’s Republic Records handling promotion to pop outlets. Does Taylor have the stomach to risk such a move? With her recent decision to make political statements, Swift has shown growth as a person. While going all-in as a Pop singer four years ago was a risk, even riskier was her decision to state her political preferences more than once leading up to Tuesday’s midterm elections. Distributor: Direct with Spotify; she could probably do a direct deal with the other streaming services, both domestically and internationally. She has the team in place and the understanding of how to do it. Or she could use an online service like Distrokid in exchange for equity, since she could turn it into an endorsement deal as well. Note that Spotify is now an equity owner in Distrokid and if Swift and Spotify both owned part of this service, that would be a marriage nobody would have ever called four years ago when Swift and her label team removed her music from the streaming platform. Otherwise, Swift could choose to go through an ADA/Orchard/RED/Caroline for distribution. International Distribution: It’s a big world. 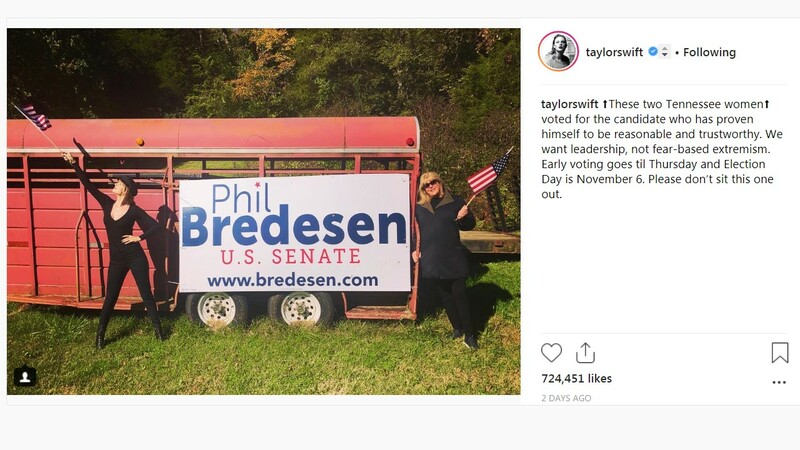 Can Taylor’s team at Taylor Nation handle that much geography? Here’s where it can get interesting. While considering herself an independent artist, Taylor can go the ADA/Orchard/RED/Caroline route for international, or she could cut a deal with Universal for territories outside of America. UMG International would receive a distribution fee that would include services beyond getting vinyl or CDs into whatever is left of brick & mortar retail outside of North America. These services could include radio promotion, marketing (think Facebook or Instagram ads in Italy or Japan or India, countries with vastly different cultures and languages that only a local office can properly handle), and possibly publicity, depending upon Tree Paine and her network. None of this is easy. Of course, we’d think it’d be easy because she’s Taylor Swift. But remember, this is a big world. She’s facing some backlash because of her political epiphany. Believe it or not, she’s also getting older. In a Pop music world that is built around youth, keep in mind that Swift turns 29 on December 13. It is conceivable that we won’t hear new music from her until she turns 30. As much as she is loved, Pop stars don’t age well musically in this era (Katy Perry, Gwen Stefani to name two), unless they turn to TV (Stefani, Kelly Clarkson) or movies (Lady Gaga) or Las Vegas (Britney Spears, Celine Dion). Does Taylor turn back to Country in her thirties? Does she pull a John Lennon and take a 5-year break at some point to raise babies? The compromise? Big Machine giving an equity in the label to Swift and then selling to a UMG or private equity group. This option may be less risky for Swift in that she would still have label backing, a royalty stream, plus equity in one of the world’s most successful independent labels that sells itself quickly, giving Taylor a nice sum of change. But is Taylor Swift willing to compromise? Based upon how she has calculated her risks well so far, both as an artist and politically, some sort of compromise that gives her additional autonomy – and rights in 10 or 20 years to her masters – may be where this ends up. However, click on the pic below and watch an interview with Taylor Swift from 2011. She has had her own management company for 7 years. She owns her own tour buses. The business infrastructure is there for her to succeed solo. But even more important, she understands that she’s a role model. While in the interview, it’s obvious that she’s talking about being a role model for her fans, she might understand that right now, in this free agency period, she’s a role model for the future of the music business. She’s already pulled her music from Spotify in the past to make a statement and threatened the same with Apple Music. There is precedent for Swift to create a new business model for artists – or at least prove to other artists that they don’t have to be beholden to some corporation. More precedent? Read this excerpt from a Q&A with Garth Brooks in the November 30, 2016 issue of Billboard:You’re no longer partnered with a major label. How are things different this time out? Think about what a record label does. It streams. We didn’t stream. It does digital, which [with] iTunes, if you don’t play by their rules you don’t play. And then the third thing is YouTube. Well, guess what: the three things that we don’t do. So we weren’t any good to a record label. We owned our own masters, and record labels make their money off streaming their masters. So even if we would’ve streamed, they wouldn’t have gotten the money, because we own it. You realize, “I don’t fit in the record-label world anymore.” So we took a breath, stepped back and hired our own radio promotions people … And then, out of the blue, here comes Amazon looking to start a streaming partnership with somebody, and they’re paying great money and their terms of agreement aren’t that long, because they’re just looking to launch and get their feet underneath them. So this is a good time for us to do our own thing. Don’t think for a minute that Taylor Swift isn’t thinking of every option that benefits her, her people, and her fans for decades to come. You might not be a fan of her music, but maybe you should respect her as a business person. “Proving doubters wrong is a big theme in the tale of Taylor Swift,” said Lesley Stahl in her 60 Minutesinterview above from 2011. Music/TV/Movies/Touring/Sports – 2026-2028 – Swift invests in the WNBA or Major League Soccer; stars in a film, her “TV” series continues without her. Break #2 – 2028-2029 – Swift has another child or two and prepares for the next chapter in her life, which begins at 40. Senator Swift, anyone?